1. EIGHT nights ago, on driving into Pennsylvania's hard-coal country, I put up at a roadside hotel in the southern part of the region and, although tired, slept hardly a wink all night. My windows were on the crossing of two state highways, and every three or four minutes a truck roared by. A coal truck. Now and then four, five trucks thundered or sputtered past in a row, shaking the ground under the hotel and me in my bed. I could not help rising every once in a while and going to the window to watch the procession. Through the night there passed that spot hundreds of trucks, large and small, new and old-some loaded with coal to the rim, others empty. The loaded ones, as I learned in the ensuing days, were headed for New York City, Brooklyn, various New Jersey towns, Philadelphia, Chester, Wilmington, Baltimore. The "empties" were returning from these places. The two-way streams of heavy traffic moved all night and continued, a bit thinned out, in the daytime. But this was nothing new. It has been going on now at this rate for over a year, practically without interruption. And similar streams of coal trucks have been moving all this time on other highways connecting the southern section of the anthracite region with the great population centers on the Atlantic seaboard and in upstate New York. 2. They are part of one of the most interesting, not to say exciting, socio-economic phenomena developed in the United States during these years of depression-the so-called "bootleg" coal, coal illegally mined by the unemployed in the mining towns from company-owned lands, for the most part in open daylight, by the most primitive methods imaginable, in complete disregard of private property rights and successful defiance of company police, and, in most places, with the full approval of the constituted authorities and of the overwhelming majority of the other inhabitants of the community; it is sold in the open market to the tune of nearly a half-million tons a month in competition with the legitimately mined coal -a fact which is beginning to cause anthracite operators and regular coal dealers in numerous Eastern cities and towns no end of perturbation. 3. Bootleg coal has a long, complicated history. Here, for brevity's sake, I shall summarize its innocent beginnings and, lest I strain some reader's credulity, somewhat simplify the fantastic situation as it exists today. 4. Ever since anyone in the Pennsylvania anthracite field can remember, it has been customary for miners and their families to go with sacks or pails to the culm dumps surrounding their bleak towns and pick coal from among the rock and slate thrown out in the breaking and cleaning processes at the big collieries. The pickers usually were the poorer families. Most of the companies permitted this, and the "pickings," as a rule, were used for fuel in miners' homes. Occasionally some miner paid his church dues or a small grocery bill with a few bags of coal he had picked up on the dumps. No one ever sold it for cash. 5. An old miner in the town of Shenandoah told me that during the great 1902 strike, when many families experienced serious difficulties in keeping body and soul together, so many pickers invaded the culm heaps that after a while hardly a lump of coal was to be found; so he and several other family men went "in the woods up on the hill over there," where they knew coal was near the surface, and "sunk a few holes," and dug what coal they needed for their own use. They worked at night. They had an uneasy feeling that this was not unrelated to thievery, "but what could a man do, I ask you, with winter here and not a dollar to his name to buy fuel with?" This, so far as I can determine, was the first time that miners started "holes" on company property without authority from the owners. 6. Early in the 1920's equipment in the collieries became so efficient that not only were thousands thrown out of work, but practically no coal was thrown upon the culm dumps; free pickings became scarcer and scarcer, and finally almost a matter of history. The result was that when hard times hit them, the miners resorted to illegal mining in increasing numbers, but still only for their own use and mostly at night. During the winter months of the stubborn 1925 strike several hundred holes were opened throughout the anthracite region. The strike ended, but conditions went from bad to worse because the companies, finding labor more and more difficult to deal with, began to install still more efficient machinery, which threw additional thousands out of work and permitted other thousands but part-time employment; so some of the holes opened during the walkout continued to be operated, and from time to time others were started. By and by, under the pressure of extreme economic necessity, illegal miners began to dig coal for their neighbors for cash, and in 1928 and 1929 there probably were from seven to nine hundred men in the six anthracite counties whose income came solely or mainly from "bootleg" coal-as they and their customers commenced jokingly to call it, because it was, in most cases, mined and delivered secretly at night. 7. In 1930, when the current depression engulfed the country, coal bootlegging probably doubled. In the town of Centralia, where nearly all legitimate coal production had ceased even in 1929, the number of illegal miners at least trebled. In the winter of 1930-31, when growing numbers of people appeared before township and county poor boards with requests for fuel, the board in not a few cases told them to get there own fuel. Where? How? The board members shrugged their shoulders or suggested that the nearby hills were full of coal. That winter coal bootlegging again doubled or trebled in most towns. In Centralia it became the main industry. It kept the stores open, the people from moving out. The bootleggers, as they actually called themselves, started to work their holes and haul down their loot in the daytime. When the coal companies had some of them arrested, the poor boards promptly effected their release if they proved they had dug the coal for their own use; and in most cases the bootlegger's say-so was sufficient proof to satisfy the poor-board members, most of whom were ordinary townspeople and, for reasons of their own, more or less anti-company. Then, too, the local courts were strongly disinclined to sentence these offenders; and when they sent them to jail, the wardens soon turned them loose. Here and there the companies blew up the bootleggers' holes, but, as the depression continued, for every hole they blew up three or four new ones immediately appeared. Also, town and county officials cautioned the representatives of the various companies that unless they allowed the jobless to operate their holes, taxes would have to be increased to pay for more relief, and some of these higher taxes would be levied on the coal mines. Thus the companies were forced or induced to "tolerate" the bootleggers, and bootlegging-not only digging, but selling as well-came into the full light of day (as in Centralia a year before) in Shamokin, Mount Carmel, Ashland, Treverton, Kulpmont, Shenandoah, Girardville, Mahonoy City, Tamaqua, Lansford, Coaldale, Pottsville, Lykens, Tower City, Reinerton, Valley View, Hegins, Donaldson, Tremont, Branchdale, Minersville, Heckscherville, Brackville, Gilberton, Middleport, Port Carbon, Williamstown, William Penn, Big Mine Run, Lost Creek, and other towns and villages in the southern section of the region. 8. In 1931 most of the coal distributed by the bootleggers was sold within twenty-five miles of where they had dug it. Much of it was delivered in sacks in the back of the bootleggers' flivvers or in small trucks hired for the purpose. That year the whole illegal output probably did not amount to more than half a million tons. In 1932, with unemployment reaching a new high, the number of bootleggers at least doubled once more and their output and business probably trebled. In the same year, it is estimated, around a thousand men, mostly young men and boys just out of high school, sons of bootleg miners, acquired second-hand or new trucks on the installment plan by paying one, two, three hundred dollars down, and bootleg coal began to be sold as far as fifty, seventy, ninety miles from the holes. 9. Since bootleg coal was peddled at a price anywhere from one to three dollars cheaper than regularly mined coal, there was great demand for it, and after a high pick-up in the last half of 1932 the business got into full stride in 1933, and today, as 1934, the fifth year of the depression, is about to amble off, there are in the anthracite region around 5,000 holes or tiny coal mines in places where coal is near the top of the earth, operated six days a week, each by from two to five men who, in most instances, have no other equipment than picks, shovels, dynamite, a lamp, a pail, and a hoisting rope; while 10,000 or more such holes already have been "robbed out." In a single town, Shamokin, about 3,500 men and boys are busy every day of the week but Sunday illegally digging and transporting coal. In Mount Carmel their number is close to 2,300, in Shenandoah approximately the same, and so on. In the entire region of 500 square miles which stretches from Forest City in the northeast to Shamokin in the southwest we have from 15,000 to 20,000 men and boys thus occupied, more than two-thirds of them being in the southern field, where bootleg mining is favored by geological conditions too complicated to be explained here. The total number of trucks hauling bootleg coal from the holes to the consumers is between 3,500 and 5,O00, and from two to three men earn their living on each vehicle. 10. Most of the miners and truckers are heads or members of families; so it is safe to estimate that 100,000 men, women, and children are directly dependent for their livelihood, solely or mainly, on bootleg coal, while indirectly nearly everybody in the above-listed and several other towns and villages benefits from bootleg coal. Bootleg coal, in fact, is the chief basis of economic life not only in Centralia, which I have mentioned, but to a lesser extent also in Shamokin, Mount Carmel, Shenandoah, Girardville, Mahonoy City, Tremont, and at least a dozen other communities. Even Pottsville and Hazleton wouldn't be the lively cities they are without bootleg coal. The amount involved in the bootleg coal business in 1933 is estimated to have been between $30,000,000 and $35,000,000, while in the last twelve months the illegal miners and truckers have "stolen" from the anthracite companies' lands from four and a half to five and a half million tons of coal, involving between $40,000,000 and $45,000,000; and most of this money stayed right in the communities where the miners and truckers reside, and was spent and respent there. 11. In other words, bootleg coal is big business; only no one engaged in it makes big money. Through the year few bootleg miners and truckers average more than $2.50 a day. The huge total sum involved in the bootleg industry is spread out very thin. It benefits enormously, not privileged individuals, as does the so-called legitimately mined coal, but the communities and the region as a whole. It keeps stores, banks, movies, restaurants, drinking places, gas stations open. It enables business people to employ help and buy advertising space in local newspapers. And so on. 12. Naturally, then, nearly everybody in the towns where bootleg coal has become an established industry is very much in favor of it. I interviewed hundreds of persons, and practically no one free of connection with a coal company had anything to say against it. I spoke with scores of bootleg miners and truckers, and the following arc some of their statements: "We gotta live, don't we ? . . . There's no work for us in the collieries with their new machines and new ways of doing things. We must do something! . . . In this town 75 per cent of the mine workers are unemployed. The relief we're supposed to get isn't half enough even for food; how about rent, light, gas, and water, clothes and tobacco? And we're entitled to a glass of beer once in a while, ain't we? Our kids and women want to take in a movie now and then. Also we gotta pay our union, lodge, and church dues.... As for the 'steeling' pert of it, how did the different companies get their coal lands ? In some cases they paid $6 an acre; was that a fair price? In other cases they stole it from the Indians. Was that a nice thing to do? Well [laughing], we're the new Indians, taking what coal we can back from the companies.... We 'steal' coal in order to keep from becoming thieves and hold-up men, which, to keep alive, we probably would be forced to become if we didn't have these holes." 13. The storekeepers with whom I talked were unanimous in saying that, as far as their businesses were concerned, bootleg coal was a lifesaver. Most of them burned illegal coal in their homes and stores. The chief of police and a city councilman of Mount Carmel were unreservedly in favor of bootleg coal. An editor of the Mount Carmel Item remarked that while the paper was neutral in the matter, he had no hesitation in saying that but for bootleg coal he might not have a job. Other newspapermen expressed themselves similarly. An officer of the state police, when I asked him what his force was doing to protect the company's property rights, smiled and shrugged his shoulders; for Governor Pinchot's administration in Harrisburg has been decidedly friendly to the bootleggers. 14. The bootleg towns are preponderantly Catholic; so, feigning concern for the Eighth Commandment, I approached several parish priests, some of whom, I had heard, were accepting church dues in the form of bootleg coal and were using it to heat their churches, parochial schools, and parish houses. All declared that the Eighth Commandment had no bearing on coal bootlegging. The so-called bootleggers, they said, had as much right to the coal they were digging as the companies. Besides, most of the bootleg holes were in places where the companies would never have bothered to take the coal out anyhow-which is true. Father Weaver, the rector of a parish in Mount Carmel, said that should the companies employ armed force to clear their lands of illegal miners, and should the men in such a case decide to fight, he would be unable to restrain himself from getting into the battle on their side. "Some of them," he went on, "are my parishioners; honest, upstanding working people. I'm proud to be their priest. It is absolutely untrue that this bootleg coal situation is having a bad effect on the bootleggers' characters or that, as the companies say, there have developed in this town 'other rackets' in connection with, or as a result of, bootleg coal. Coal bootlegging has no bad moral effect on the people. It keeps them from starving and turning into criminals.... Let the companies give the men work in the collieries and illegal mining will cease at once. The men are not bootlegging because they like it. They risk their lives every minute they work in those holes, and deserve everyone's respect and admiration. They have mine." 15. They have mine, too. In fact, after I saw them work in and around their holes, my respect for the human race in general went up several notches. The sheer "guts" and stamina necessary to sink and work a bootleg coal hole is all but incredible. Imagine a hole in the ground, barely wide enough for a man to let himself down in, usually vertical, sometimes cut into living rock, anywhere from twenty to a hundred feet deep, with just sufficient room at the bottom for the miner to sit or kneel and work his pick and shovel and sticks of dynamite. 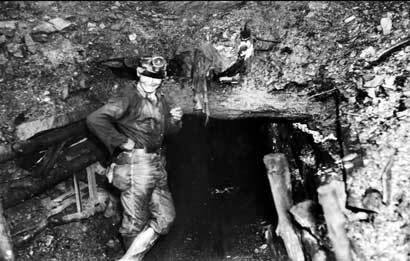 Personally, I would rather do anything than start and operate such a hole; but then, of course, I am not a miner in extreme economic circumstances, nor a miner's son with mining in his blood and no chance of regular employment. It takes two, three, or four men from two weeks to two months to sink a hole and reach the outcrop, after which they usually strike coal. Working mainly on hunches, they very often find no coal, and all the terrific labor is in vain. When they find it, two, three, or four men produce about as many tons a day, hoisting the stuff to the top of the hole with rope and buckets, then breaking it, often with hammers by hand or chunk against chunk, and cleaning and sorting it also by hand, unless they have a primitive breaker and shaker either at the hole or behind their houses in town. The work is back-breaking and extremely hazardous. Most holes are inadequately timbered and cave-ins are frequent, trapping or crushing the men below. Sometimes the ground at the bottom of the hole, where the man is knocking or blasting out the coal, sinks away from under him and he tumbles into the flooded cavern of some worked-out mine, and that, of course, is the last of him. 16. Everybody who knows anything about the conditions under which bootleg coal is produced respects and admires the bootleggers, and often considers them heroes; and this- together with the fact that the whole thing is so typical of this resourceful, highly individualistic, anarchic, and fantastic America of ours-operates to create public sentiment strongly in favor of the illegal miners, quite apart from the economic benefits that this curious industry brings to the communities. Even a company official said to me: "Those fellows take such gosh-awful chances that in a way they're entitled to that coal." 17. The coal is sold to truckers who come to the holes at from $4.50 to $5.75 a ton, depending on the quality and on whether it is stove or nut. The truckers have either direct customers of their own in Philadelphia, New York, Baltimore, or wherever they take it, or agents who get the orders for them from housewives and landlords. Delivered, say, in Philadelphia, Newark, or New York, the coal sells from $8.50 to $11, or a dollar or two cheaper than regular coal. The agent gets from 25 to 75 cents a ton commission. The bootleg coal usually is not as clean-looking as regular anthracite, but actually most of it is quite as good. Demand for it continues to exceed production, and everywhere in the southern section of the region I saw trucks waiting for loads at the holes. Production, however, rises steadily; and if nothing drastic is done by the companies or the state to stop it, the business is likely to continue booming in 1935. 18. Most of the coal now being "stolen" from the bootleg holes, as already suggested, would never have been touched by the companies who legally own the lands. It would have been too uneconomical for them to mine it. Much of it was left over by regular mining operations. Only in a few places -Shamokin, for one-are the bootleggers tapping big veins, which the owners eventually would strip and get out with giant steam shovels. So in most cases the regular operators do not object so much to the coal being "stolen" as to its being sold so successfully in such large quantities; for between 5 and 10 per cent of all anthracite sold in the United States these past two years was bootleg. That is serious competition, cutting deeply into the profits of the operators and distributors. In view of the fact that the whole law and order apparatus, the moral forces, and most of the general public opinion favor the bootleggers, the operators can do little about it at the sources of bootleg coal, now that the thing has been allowed to develop as I have described it. In Shamokin, early in December, the Stevens Coal Company tried to start stripping operations on the so-called Edgewood Bootleggers' Tract, where 1,700 illegal miners eke out their livelihood, but the men promptly dynamited the steam shovel and told the company employees who brought it up to beat it. No one has been arrested for the deed. At Tremont, two months ago, more than a thousand bootleggers faced about fifty company police, and a battle was averted only by the withdrawal of the police. At Gilberton not long ago the automobile of a coal-and-iron cop was dynamited after he had blown up several holes. The Philadelphia and Reading Coal and Iron Company's private police blew up, between the first of January and the last of November of this year, 1,196 holes, but in that time at least 4,000 new ones were started on their properties. During the same period the same company caused the arrest of seventy-seven bootleggers, but in vain. No jury in any anthracite county is ready to convict anyone for "stealing" or trucking coal. 19. So lately the desperate operators and distributors have been spending vast sums of money and no end of energy and legal and public-relations talent to ruin the bootleg coal business in Philadelphia, Newark, and elsewhere by telling the public, through the newspapers and otherwise, that bootleg coal is a heartless racket run by a few wise guys who exploit thousands of men, women, and children; that bootleg coal is dirty and otherwise inferior; that bootleg truckers deliver short weights, and so on. In Philadelphia the authorities were induced to invoke against the bootleg coal truckers old ordinances regulating weights and truck traffic which had not been enforced against the regular coal dealers and truckers for years. Upon the highways in New Jersey the state police are induced to arrest bootleg truckers for transporting stolen goods, and there have recently been instances of heavy fines and jail sentences. But so far all these efforts of the companies have had no serious effect on the virility of the bootleg-coal ndustry. What other measures the companies will think of, I don't know. Certain it is, however, that they will do everything possible to regain the market that bootleg coal has taken from them. Much will depend on the attitude that the incoming administration in Harrisburg will take toward the problem. Governor Earle will probably be inclined to follow the Pinchot policy of friendliness toward the bootleggers, for in the last election they showed themselves to be a political power; but it is possible that the new Lieutenant Governor, Tom Kennedy, who is also international secretary-treasurer of the United Mine Workers- which organization in the anthracite region is essentially a collection of company unions and therefore anti-bootlegger- will try to prevail upon the highest authorities in the state to help the companies bring about a showdown on the matter and drive the bootleggers out of their holes. 20. Meantime the bootleggers are organizing to protect what they call their interests. In Shamokin I attended a meeting of the Independent Coal Producers at which I was given to understand that, while eager for peace, they were ready to fight "for their right to live." The same is true of organizations in the Tremont district and in Mahonoy City, where not long ago Congressman-elect James Gildea spoke at a meeting of 400 bootleggers called to protest against the dynamiting of a number of holes by the companies. Mr. Gildea, who is a Coaldale man, declared he was with the bootleggers. They had been instrumental in electing him. Several illegal miners said to me: "If they close our holes, we'll gang up on their collieries and close them." 21. The bootleggers are so strong that in all probability no drastic action will immediately be taken against them. The thing probably will go on for quite a while. It will be full of possibilities, however, chiefly in the direction of violence; for in the anthracite region dynamite is plentiful, while labor-trouble service agencies are urging the companies to fill the holes with light poison gas, which would stay in them for months and sicken the bootleggers who attempted to work them. 22. At the end bootleg coal probably will peter out, as do most things in America. Here and there groups of bootleggers already are coming to terms with the companies and are beginning to pay them royalties on every ton of coal they dig. I met company officials who felt that eventually the New Deal might come to their aid. The federal government might take the surplus populations in these towns and transfer them to the land-to subsistence homesteads, of which there has been talk for some time. 23. Some of the radical intellectuals who have visited the region to the contrary notwithstanding, there is no revolution in coal bootlegging. Most of the bootleggers are anti-Communist, and the few, very few, radicals I met among them told me that bootlegging is largely responsible for the fact that there is almost no real radicalism, no movement of any size, in the southern anthracite towns. Coal bootlegging is nothing more or less than a depression industry. But eventually it may have some slight revolutionary importance. This "stealing" on such a grand scale in open daylight unquestionably causes hundreds of thousands of people-not only the bootleggers-to contemplate private property rights with less awe, and the eventual nationalization of coal mines possibly will come a bit easier and faster because of it. Some of the above, as some of the following, figures may be disputed. No accurate statistics are available, of course. The figures are a compromise between the bootleggers' exaggerated idea of their strength and the more moderate estimate of the company officials. Louis Adamic is also the author of Dynamite: The Story of Class Violence in America; (1931, reprinted 1984 by Rebel Press, London), a classic book on the history of class struggle during America's industrial beginnings. This article was originally published in "The Nation", 9th January 1934. If you want to learn more about this, check out The Bootleg Coal Rebellion!